Colonial river port, incorporated in 1762. Later merged with Cross Creek to form the town of Fayetteville. 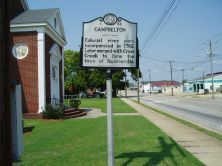 Named for a town in Argyllshire, Scotland, from which many of its inhabitants had migrated, Campbelton (also spelled Campbellton, Campbelltown) typified the heavy Scottish influence in the upper Cape Fear River region. Settled in 1739, and officially incorporated by an act of the Assembly in 1762, the town was a trading center connecting the head of navigation for the Cape Fear with the seaport of Wilmington. 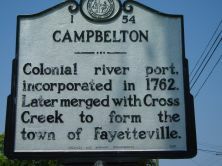 Campbelton and Cross Creek coexisted as trading villages on opposite banks of the Cape Fear River. Although commonly thought of as “Scottish trading centers,” both towns had a diverse population with many being New Englanders and Pennsylvanians who had arrived to market their goods to the Scot settlers. The community developed quite quickly and, shortly after incorporation, had “marked out its bounds, and there then about twenty habitations,” according to traveler William Bartram, whose kinsman lived in Bladen County. In 1771, the colony established a public road from Campbelton to the Yadkin River, and ultimately Morganton, further expanding trading routes. Seven years later the county court moved from Campbelton to Cross Creek, and the two communities combined to form Upper and Lower Campbelton. Campbelton played an active role in the American Revolution. In 1776, the village provided a staging area of Highland Scots, specifically those who fought at Moore’s Creek Bridge, including the husband of Scottish heroine Flora MacDonald. In 1778, a county decree ordered 400 citizens to take an oath of allegiance to the United States. Three years later, in April 1781 Lord Cornwallis marched through the community on his army’s retreat to Wilmington. “Seventy-First” township, which existed alongside Campbelton until the nineteenth century, referred to the 71st Foot, a Highland regiment of Cornwallis’s army. In 1783, at the conclusion of the war, the Legislature renamed the combined villages Fayetteville in honor of Marquis de Lafayette.